The City of Vancouver is in urgent need of interested, engaged, effective leadership. Working to solve housing affordability crisis. Working with Province and local municipalities to improve transit. Frequent trade missions to China. If interested, please contact City Hall. By now, everyone is probably familiar with the annual Demographia Housing Affordability Survey. 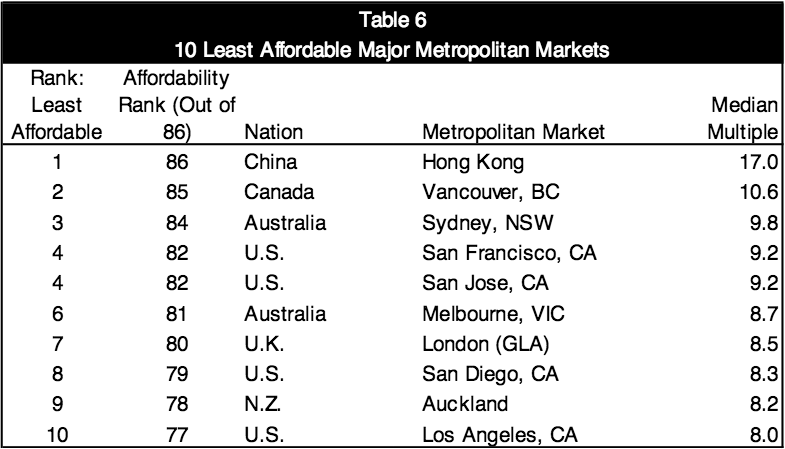 In last year’s report, Vancouver — with a house price to income ratio of 10.6 — had the second worst affordability behind only Hong Kong. But the numbers they used to arrive at that multiple are now a year old. How has the picture changed since then, and what is the current ratio? The median house price then was $704,800 and the median household income was $66,400. According to the latest REBGV numbers, house prices in Greater Vancouver have increase 20.1% in the last year. And BC Stats reports that average earnings are up 3.8%. Applying those increases to last year’s Demographia data, we can estimate that the new median house price is about $846,500, and median household income is now around $68,900. If these numbers are accurate, then the median multiple for Vancouver is now 12.3 — higher than any US market at the peak of their bubble. This is the new North American record for poor affordability. Congratulations Vancouver. Last May I discovered that real estate prices in Metro Vancouver were now being driven by high-end home sales. The only logical conclusion seemed to be that foreign buying was now the primary driver of the Vancouver real estate bubble. We now have hard data that proves the high-end is being bought by Mainland Chinese money. In a recent six-month period about 70 per cent of all detached homes sold on Vancouver’s west side were purchased by Mainland China buyers, an academic case study shows. How much more proof do we need before our politicians address the biggest issue in the decline of Vancouver?